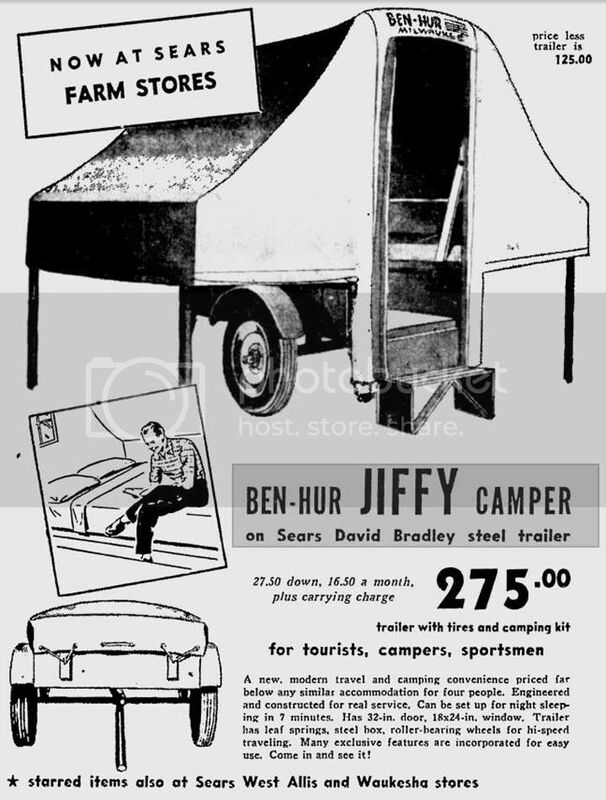 I've been thinking of trying to build a copy of sorts of the Jiffy Camper for my Ben-Hur trailer. I'm hoping somebody here may have some experience doing something like this, considering its a little like the jeep tops. It looks like a thin type material, I was thinking of using a good thick cotton canvas for the top and maybe a thinner canvas for the sides and putting Canvak on it, would this work out ok or would I be better off with a tent material that is already water proofed? Just go buy one, its only $275 for the whole thing. 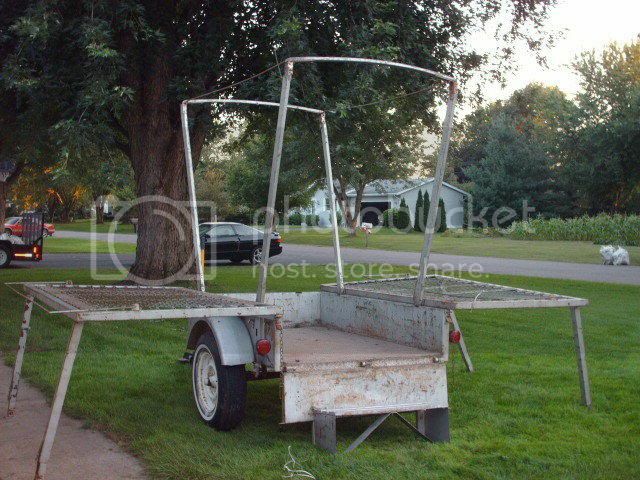 I've been thinking of the same sort of setup for my Bantam trailer. Bear Creek Canvas has canvas patterns for Appleby & Apache trailers from the 60s that may just do the trick! Yea wish it was that easy, more than likely I'll have that much or more in just materials . That's cool that you can still get the top for those, it doesn't look like it would take a lot to make it work on a bantam or even the sears trailers. I've been thinking about such cool plans forever. My problem is that I'm tall. I need an 80" bed (like a queen or long-boy double or twin). Often, the queen bed sold in RV's these days are what's called an RV Queen, which is what, 74" long? Anyway, more than 6' and less than 80". My Spen trailer only has a 6' box, so any "pop-up" I design like these would created sides beds too short. Maybe laying a bed east west? (left to right), AFTER popping up? Also, think about that structure. All heavy metal? What about fold out plywood sides with hinged leg/supports that once out, provide the right size "platform" to simply set up a tent on? Buy a modern lightweight tent and set it up on the platform. Size the tent to your trailer size capability? Cut the tent floor out where the box is and finish the edge so it doesn't fray. Maybe something like that? As far as a mattress we've been using the inflatable kind. I think Coleman and others mfg. them. They are pretty darn comfortable compared to the old school mattresses. We keep several of them at our Cabin when the guests out number the Beds. Nobody complains. One or 2 of these might work for you. I haven't given up on this project, it's just moving super slow . The family that has the original Jiffy Camper contacted me and has been super helpful getting me pictures and measurements. The frames are actually much more complex than I would have thought, they aren't a normal dimensional steel, it's actually a folded and rolled steel. So I'm not going for a exact copy, mine is just 2x2 angle, and some old legs off a sign stand I got at the junk yard. I wasn't sure what to do for wire and springs, but a friend was changing his trampoline tarp so I thought I would try using it. 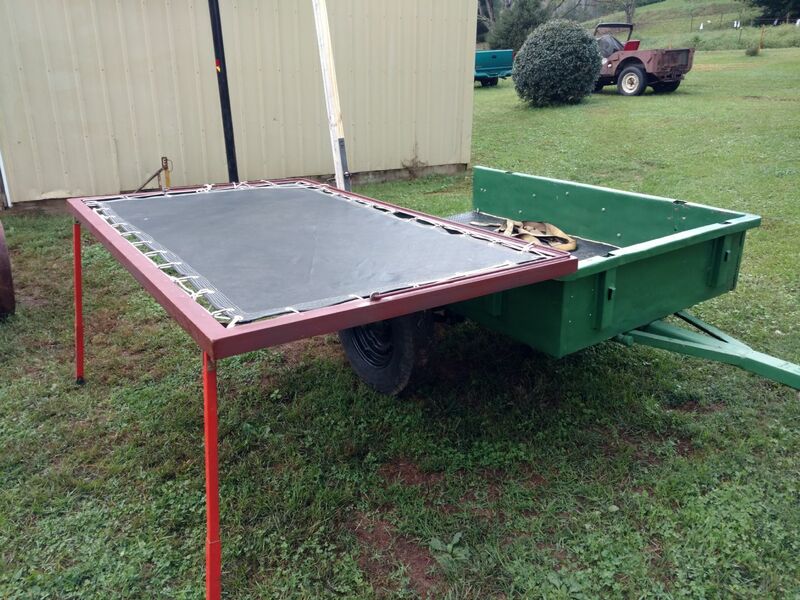 Trampoline is a great idea and lightweight. For tent I would definately lean toward tent/ awning material. Google Sunbrella material for ideas on color and designs.....could make a neat little pop-up. My '47 Bantam came to me with some home-made "arches" and sides on it. The material for the top that came with it was no longer usable though. What was pretty ingenious was a PO cut a couple 4x4s diagonally and bolted them to the sloping sides of the tub to create a flat pair of mounts. Then he/she cut some 3/4" plywood carefully around the stake pockets (he used three sections) so he had a flat bunk surface. Once that was done, he then had storage under the plywood and could put a mattress on top of the plywood. 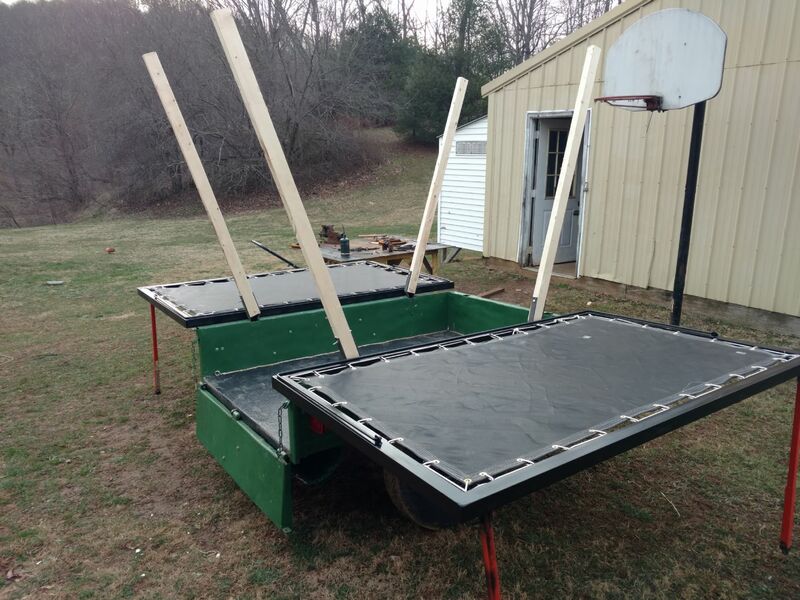 You could...do roughly the same thing but make the rearward plywood section longer than the 72" of the bed so that when you arrived at camp, you unloaded the trailer, slid the rear section into position, bolted it through the side mounts and the sloping tub. this section would be the additional length you need to get it to 80". 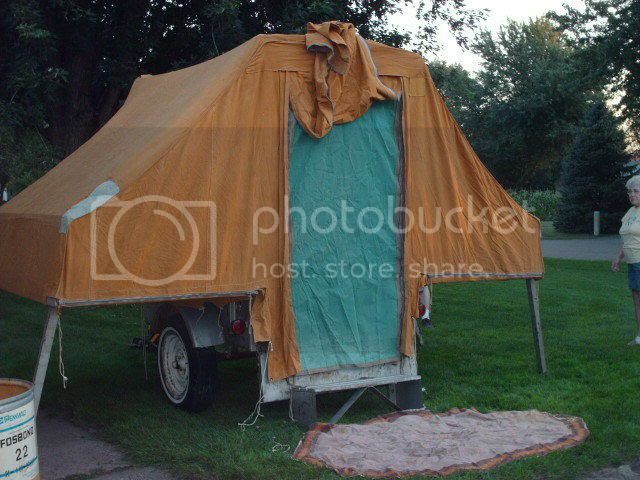 You still need to fabricate some kind of canvas top for your trailer or just use a big tarp and bungie cords you put up when you arrive at camp. You can't go down the highway with the canvas top UP or you will shorten its lifespan dramatically. You would need an additional rib section to hole the tarp up an additional 12-16 inches behind the trailer I think. A little personal design preference might include an extended section and a couple poles to give you a covered area behind the trailer if you wanted it. I slept in my Alaskan, but towed the Bantam with everyone's coolers and things that did not fit into their jeeps on a recent expedition to Hell and Gone and the dust was ridiculous...I believe if you intend on taking a Bantam into the boonies, that you insure that you can tarp the bed of the trailer to keep the dust and the rain OUT. You won't get it ALL out, but a trusty whisk broom (hand held) will help you with that. You don't want your mattress getting dusted! I pre-loaded stuff into a couple beat up footlockers which protected my stuff from dust and served as tables in camp. They would fit just barely under the plywood if I had wo those sections fitted in place before departure. Making a little more progress, finished the other bed frame and have started making the uprights. I think I may try to make something to steam bend the bows, the basic principles of doing it look somewhat easy.